Good morning and welcome to Fresh Intelligence, our roundup of the stories, ideas, and memes you’ll be talking about today. In this edition, Obama throws some expert shade, Trump defends his treatment of women, and Mark Zuckerberg will meet with conservatives. Here’s the rundown for Monday, May 16. 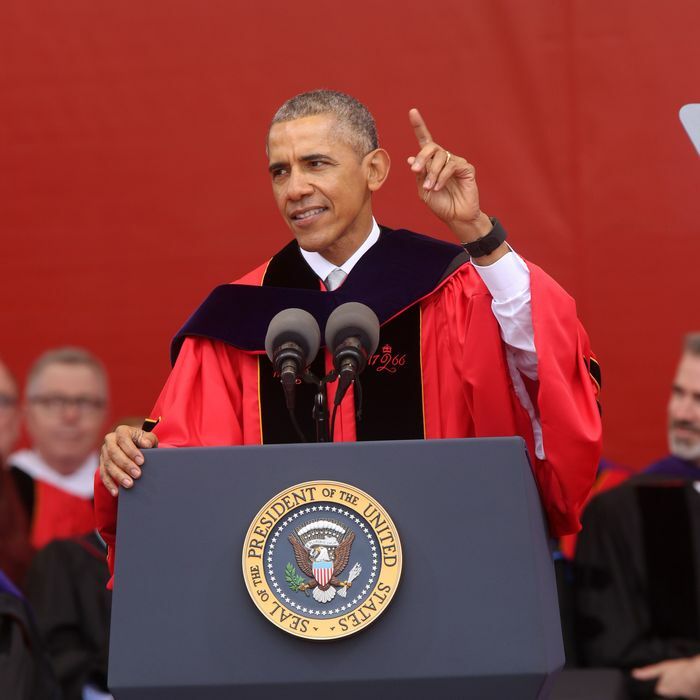 President Obama’s commencement speech at Rutgers University on Sunday was also a thinly veiled condemnation of presumptive GOP nominee Donald Trump. In it, Obama spoke out against Trump’s “anti-intellectualism,” his “disdain for facts,” and his isolationist foreign policy. And, just in case we still didn’t know who he was talking about, he threw in references to Trump’s Mexican wall and “suggested” Muslim ban — but stopped just short of saying Trump’s name out loud. The man is a master. After Facebook was accused of favoring liberal-leaning stories in its trending-topics bar, Mark Zuckerberg got an angry note from Republicans in the Senate demanding answers, and it seems he’s willing to talk. On Sunday radio personality Glenn Beck announced — in a Facebook post, no less — that he and several other conservatives were invited to the company’s Menlo Park headquarters to work things out with the CEO himself. Passengers across the country have been complaining of abnormally long airport security lines — to the point that the Department of Homeland Security got involved. We’re just saying this could be part of the problem. Who said baseball isn’t exciting?